But then AT&T, Verizon, and Best Buy all backed out of or canceled deals to carry the company’s phones in retail stores; all while Huawei faced even greater pressure from U.S. intelligence. 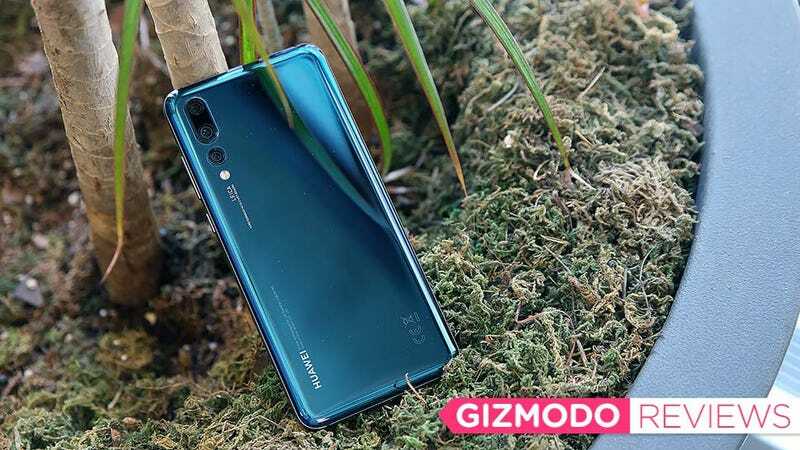 That left Huawei’s latest flagship phone—the P20 Pro—in a weird place, because instead of potentially being the first P-series phone to get sold in America, we’re left watching it thrive overseas with no hopes of a stateside release. And that’s a damn shame, because with a gorgeous design and an innovative triple camera setup, the P20 Pro is actually a pretty great device. Even just looking at the specs, you can see where Huawei made a lot of smart decisions. Featuring a Kirin 970 processor, 6GB of RAM, and 128GB of storage as standard. (There’s no microSD expandability, but who really cares these days.) Meanwhile the dual SIM tray is a boon for frequent travelers. But P20 Pro’s real treat is its giant 4,000 mAh battery. On our battery rundown test, the P20 Pro lasted 11 hours and 36 minutes. That’s better than even the Pixel 2 XL (11:17), though still slightly short of the S9+’s time of 12:27, which remains the best time we’ve recorded yet this year. Then there are other little things like the IR blaster embedded in the top edge of the device, which is feature that used to be quite common, but almost every phone maker has long abandoned. And as you’d expect from a phone of this caliber and price, you get IP67 water-resistance and some pleasantly powerful stereo speakers. That said, the P20 Pro still has two big sticking points: the lack of a headphone jack and wireless charging. Being forced to use USB audio is something you can mull over yourself, you can either deal with it or you can’t. But no wireless charging is a strange omission considering the phone’s 900 euro price tag, which translates to around $1,100. Unlike last year’s P10, whose metal back made it difficult for the phone to play nice with wireless charging tech, the P20’s back is a big sheet of glass. For a phone this expensive, there’s really no excuse. You might hate the notch, but you have to admit the P20 Pro is still a damn good looking phone. From left to right the P20 Pro features a 20-MP monochrome camera, a 40-MP RGB camera, and an 8-MP camera with a 3x optical zoom. Perhaps Huawei’s plan was to dazzle users with one of sparkling colors. With an entrancing color shift from green to purple, Huawei’s signature Twilight paint job looks like nothing else out there. But even in the standard blue of our review unit, the P20 Pro is just as sharp. Now I know some people might take issue with Huawei’s use of a notch, but there really isn’t anything to complain about. Out of the box, the cut out for the P20 Pro 20-MP front-facing camera is pretty obvious. But if you’re not a fan, there’s an option in the display settings to mask the notch with black bars on either side. This gives you the ability to see your notifications and time, date, and battery like you would normally, but without having something protruding into the screen, and in my opinion, it’s the best blend of form and function. From left to right, you’re looking at the P20 Pro’s 20-MP monochrome camera, a 40-MP RGB camera, and an 8-MP camera with a 3x optical zoom. But enough with all the dilly dallying, how bout those cameras? 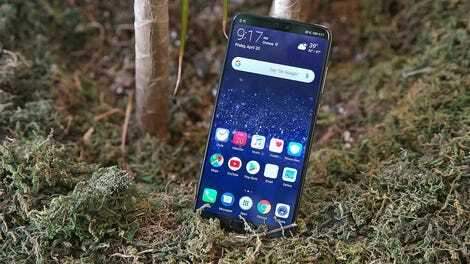 Sporting a 20-MP black-and-white camera, a massive 40-MP RGB camera, and a 8-MP camera with a 3X zoom, Huawei’s world-first camera arrangement has something for everyone. Using the monochrome cam, even on something as simple as a black and white photo, the P20 Pro easily out shot the Galaxy S9 in gray scale mode. Frankly, it’s not even close, as the P20 Pro’s captured much better details and sharper edges versus the complete oversaturation seen in the S9’s pic. And these abilities aren’t relegated just to black-and-white shots either. When using the 40-MP RGB camera, which is what the phone relies on most of the time, the P20 Pro uses the monochrome camera to help capture fine details, while the 40-MP camera concentrates on colors and everything else. On top of that, the P20 Pro’s 40-MP sensor uses a quad bayer filter which creates groups of four pixels and essentially combines them into one giant pixel, which lets the camera soak up a ton of light. So in the end, the phone spits out pictures that are just 10-MP in resolution, which are just slightly smaller than the 12-MP rear cameras in Pixel 2 XL and Galaxy S9, but not by much. And what you get in exchange for the loss in overall resolution is totally worth it. Even though the P20 Pro’s pic has less megapixels, it still looks sharper. Just take a look at how the S9 and P20 Pro snapped a pic of some plums. The S9’s shot isn’t bad, but the P20 Pro’s pic has it beat it almost every single way: sharpness, color, detail, you name it. The most obvious example is when you zoom in to look at the labels on the fruit. The barcode and lettering in the S9’s photo looks a little fuzzy, while in the P20 Pro’s pic, lines are bold and crisp. Now I must point out that the P20 Pro’s pic is probably a little oversharpened, but it still beats the S9’s version hands down. In standard auto mode, the P20 Pro’s low-light skills fared well against the Galaxy S9. And in low-light things get even better, because that quad bayer arrangement lets the P20 Pro hang with the S9, despite having a smaller f/1.7 aperture compared to the S9’s industry-leading f/1.5 iris. When you turn on the P20 Pro’s advanced night mode, low-light photos look really impressive. But then, Huawei went the extra step and created an incredible low-light mode that captures four-second long-exposure shots that can be taken even while hand held. That’s right, no tripod needed. Now normally, this would cause streaks all over the place (and if people move around too fast, you still get a little motion blur), but on the P20 Pro, you get a sort of specialized nighttime HDR shots that often look shockingly good. The extra level of reach you get with the P20 Pro is a nice bonus. Finally, there’s that 8-MP camera with a 3x optical zoom, which is 1x more than what you get on the iPhone X or Galaxy S9. So when you need that little extra reach, like say when you’re at a ballgame or concert, the P20 Pro has got you covered there too. However, the P20 Pro’s cameras aren’t without their flaws. Like the Mate 10 Pro. the P20 Pro has the ability to use object recognition to identify things like dogs, plants, and food, or scenes like landscape and blue sky, and then use that info to fine tune the camera settings for optimal results. The problem is that it seems in the six moths since Huawei’s last iteration, the company may have pushed its algorithms a little too far. If you don’t step in and stop the AI, the P20 Pro camera can sometimes get a little too bold. For example, when I snapped very typical shot of some flowers, the P20 Pro pumped up saturation of greens and yellows to an absurd degree, to the point where the pic almost looks neon. You can also kind of see in the clock photo above, where the blue-sky mode does a little bit too good of a job making those blues stand out. Thankfully, disabling the auto-tuning is as simple as hitting the little “x” next to the object recognition tag in the camera app. But here’s the real tragedy, Huawei isn’t selling the P20 Pro in the states, and based on pressure from seemingly everly level of the government, there’s almost no chance that will change. In fact, just four months in, it seems Huawei may have already decided to reconsider is expansion into the US, in favor of refocusing its efforts on more welcoming markets like Europe and Asia. That means like all those fancy cheeses made in France and elsewhere, or genuine Kobe beef from Japan, the Huawei P20 Pro is a delicacy only available overseas. That’s pretty depressing, because this is an exciting, innovative phone that gives Apple, Samsung, and Google’s best some actual competition. And the worst part about all this, is that we really only have ourselves to blame. The P20 Pro isn’t available in the US, and Huawei has no intentions of bringing it over. While sometimes you have to fiddle around with the settings or veto the aggressive AI, the P20 Pro’s triple cam setup is no joke. Battery life is fantastic, with the P20 Pro lasting over 11.5 hours on our test. Huawei’s EMUI 8 is easy enough to use, but I still don’t think it looks quite right. There’s no headphone jack, wireless charging, or microSD card slot, though there is support for dual SIMs.